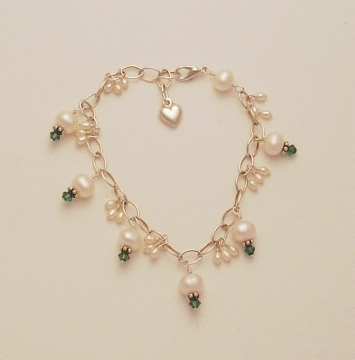 This classic bracelet uses bulk, sterling silver link chain, to which I have attached elegant white freshwater pearls, and Swarovski crystals for sparkle. It is finished with a tiny sterling silver heart charm dangle as an accent. Because I am using simple link chain, it can be closed anywhere along the length making the bracelet adjustable. To save time, you could also use a pre-made chain charm bracelet if you prefer. 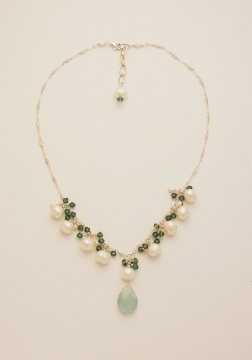 Use any color of pearls or crystal beads you like. 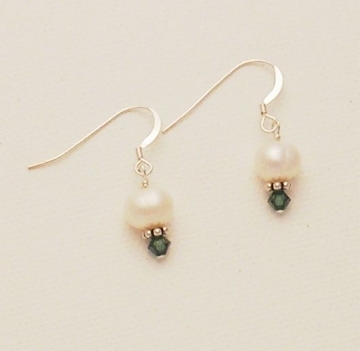 Clear crystal beads with white pearls would make a great wedding jewelry design, or why not use birthstone colors for a special birthday gift? One length of bulk link chain, or a pre-made charm chain bracelet. I used about 8 inches, allowing the length to be adjustable, depending on where the clasp is attached. 7 Swarovski crystal beads (or use any accent beads you like). Here I used green tourmaline colored beads. One charm of your choice. Here, I am using a small sterling silver heart charm. 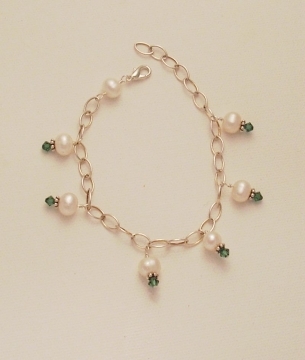 Cut the chain to the desired bracelet length, and using a basic wire wrap technique, attach the chain to the lobster claw clasp with one pearl bead in the center. Follow the wire wrap instructions if you are not familiar with this technique. TIP - If you are using bulk chain like I am, first determine the length you want your bracelet to be. For an exact fit, measure the wrist and cut to length. If you want the bracelet to have an adjustable length, add some extra to the length and cut the chain there. I left an extra inch and cut my chain about 8 inches long. To save time, I make all my pearl "charms" ahead of time, using my chain and round nose pliers to make a basic wire wrap loop. Slide a crystal bead, then a Bali spacer bead, and then a freshwater pearl bead onto a headpin, and make a loop at the top so you can attach it to your bracelet. If you are not familiar with this wire loop technique, click here to learn more. Lay your pearls out along the chain and decide where you want to position them along the bracelet. Make sure they are evenly spaced along the length. Use a bead design board or a ruler if you like. 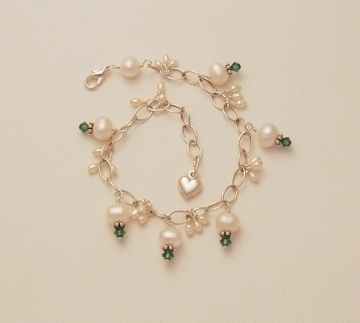 Attach each pearl "charm" to the bracelet. For added interest and movement in a design, I often like to mix in a small "spray" of beads in-between larger beads. In this bracelet, we will attach three tiny seed pearls at the same point on the chain, creating a spray of beads. 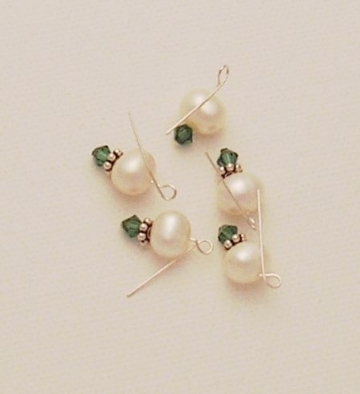 Slide each seed pearl onto a headpin and make a loop at the top with your pliers. Again, lay out the beads to make sure you have them positioned where you want in-between the larger pearl beads, and attach them to your bracelet chain. Using your pliers, open the jump ring on the charm and attach it to the other end of your bracelet. Close the loop so it is securely attached. That's it! Make the matching necklace and earrings!